plugged in, late afternoon coffee - just for fun! See Author's note below! It’s springtime – or pretty darn close. The days are getting longer and slowly warmer. Yesterday it was in the sixties and windy with gusts in the 30-40 mph range. It’s been a pretty lame winter and I’m glad it’s getting closer to spring. There is that feeling in the air when it smells like spring. The wind howls and you know, really know, that warmer days are near. Right now, it is that time in the day when the sun seems to hang in the air and make the afternoon linger and seem to last another hour, or two. It is also another time of the year – annual testing. In my school, my students are taking the state tests to see if they have learned what they were supposed to have learned in class. I am sure they’ll do well. I know they can read, write, and think. We’ll get the results in the fall and by then, I’ll have a new batch of kids in my room who took the sixth grade tests this year and I’ll be ready to share seventh grade reading, writing, and thinking and it will start all over again. Olivia and William are taking tests, too. In fact, students across Illinois (where I am) are taking the state tests; grades 3 through 8 are taking the state tests in reading and math. It’s happening across the USA, or will be soon – kids taking tests in math and reading and then the tests are compared to each other and states are pitted against each other as they clamber toward the top, in a race to the top. But, I am not going to kid myself. I don’t teach to the test. I teach kids. I teach kids that learning is important, that it’s the key to the future. I teach kids that writing is fun. I share that there are wondrous things out there, which they haven’t found yet, but they will. I shared what I am reading and what I have learned. I do it every day, but I do not teach to the test. If I taught to the test, it would leave out all of the fun stuff, the stuff that is truly relevant to them – like banana stickers and the sunshine report. I’ll leave teaching to the test to teachers who don’t want kids to have a natural love for reading, writing, and thinking. I’ve been teaching for thirteen years and I found the cartoon above many years ago, I think in my second year of teaching in 2001. 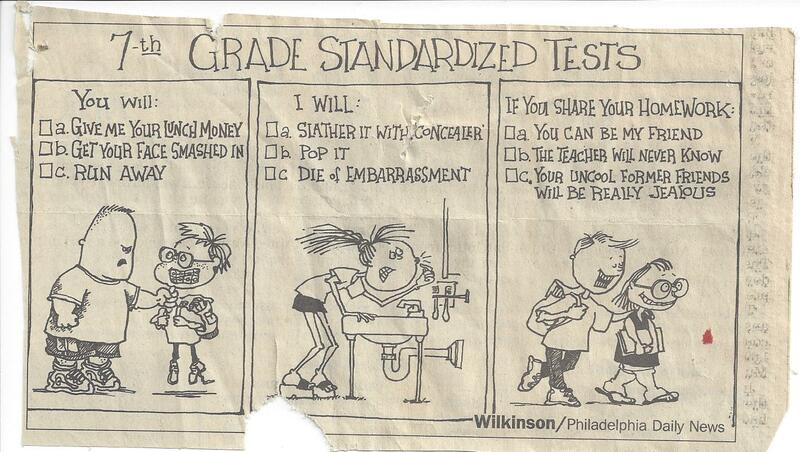 At the time, I thought it was funny, cut it out, and saved it; eleven years later I am sad because it isn’t funny in the humorous sense but I can remember what it was like to be a seventh grader and doing well on the test was not one of my top priorities. I was more worried about the other ‘tests’ – being cool and with-it and I wasn’t. I still am not cool or with-it, but I get it. Learning to read, write and think is far more important than being cool. Making the Days Count, reading, writing, and thinking. What are some of the ‘tests’ you remember – that you can write about? AUTHOR’S NOTE: It has been a hectic day and I wanted to write – to finish the thought that was on my mind. 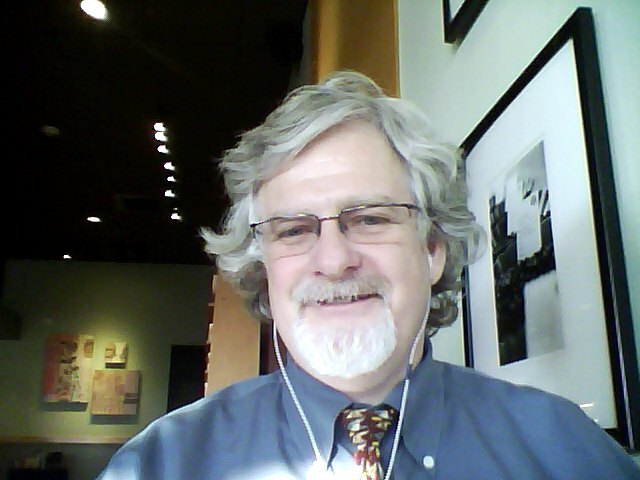 I stopped on the way home, plugged in, got a cup of coffee and was whisked away to late afternoon writing. I shot the photo at the top for fun – I am wearing one of my favorite ties – the chicken and egg tie. My dad gave it to me in May 1997 when Beth and I visited Paris – BK (before kids). The sun, the music, and the tie bring back pleasant memories. Good blog. Too many teachers are forced to teach the test and the kids like you said don’t give a flip about their score other than to pass it and get it over with. Back in the olden days they hadn’t thought up of those tests. THank you very much.